Scott Pilgrim, the heroic comic tale of triumph over evil ex-boyfriends, is getting a movie adaptation next year, and Ubisoft has signed on to create the game of the movie of the comic. Bryan Lee O'Malley's Scott Pilgrim is a digest-sized comic series from Oni Press that follows the tale of Canadian slacker bassist Scott Pilgrim. Scott has met the girl of his dreams, but in order to keep her he must defeat her seven evil ex-boyfriends. If the plot sounds familiar, you are a male who has dated. Michael Cera and Mary Elizabeth Winstead are starring in the film adaptation, directed by Edgar Wright of Shaun of the Dead and Hot Fuzz Fame. Ubisoft Montreal is developing and publishing the video game adaptation Scott Pilgrim Vs. The World, due out in 2010, just in time for the film's release. "We're excited to work with Universal to create a video game experience based on the Scott Pilgrim universe," said Christian Salomon, vice president of Worldwide Licensing at Ubisoft. 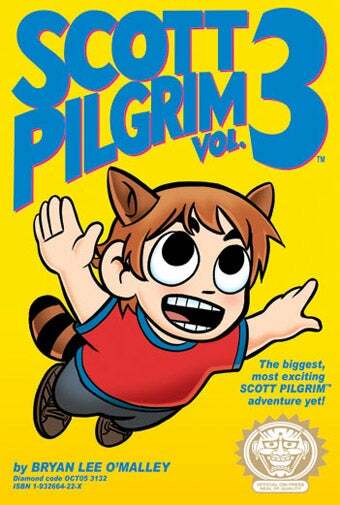 "Scott Pilgrim is a special property, one that is both nostalgic and completely original. The game will provide a fun and unique experience to players and combine all the important elements seen in the film-action, romance, irreverent pop culture references and rock-n-roll." The release didn't say anything specifically about platforms, or whether they would be adapting the comic art style or going for something more live-action movie related, but I'm sure that information will come to light in due time. And yes, this was announced at Comic-Con, but we were busy being exhausted.